Xavier Sala-I-Martin once wrote a paper called “I just ran two million regressions”. I can’t do quite as good, but I nonetheless have had a look at the nominal GDP growth of 143 countries since 1990. My “project” is to see whether there is a correlation between the growth rate of NGDP and the volatility of NGDP. We know from inflation history that there is a pretty close positive correlation between higher inflation and higher volatility in inflation. My expectation was that that would also be the case for NGDP and NGDP volatility (measured as the standard deviation of yearly NGDP growth across 143 different countries). But more important I wanted to see whether we could say what would be the “optimal” growth rate of NGDP. By “optimal” I (here) understand the rate of NGDP growth that minimizes the volatility of NGDP growth and hence increases the predictability of NGDP growth. Let’s first look at the data in the must raw form. This is a plot of the average yearly growth rate of NGDP in the 143 countries against the standard deviation of the NGDP growth rate in the same countries. I have split the period 1990-2011 into four sub-periods 1990-1995, 1995-2000, 2000-2007 and 2007-2011. That gives us four observations per country – nearly 600 observations. 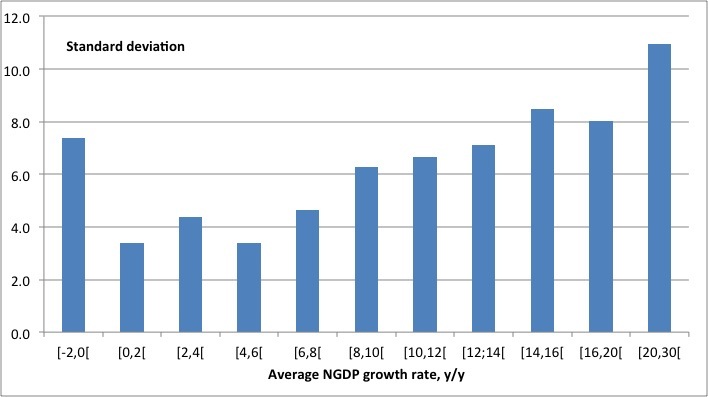 The graph is pretty clear – as with inflation there is a pretty clear positive correlation between the level of NGDP growth and the standard deviation of NGDP growth. Hence, there is a clear cost of higher NGDP in the form of a more volatile NGDP development. Therefore an NGDP target of 3 or 5% growth clearly is preferable to an NGDP target of for example 10 or 100%. However, if lower NGDP growth reduces the volatility of NGDP why not target -10% NGDP growth or lower? To examine this issue I take a closer look at the data. The graph below zoom in on countries (and periods) with an average growth rate of NGDP below 30%. Again we see the clear picture that higher NGDP growth leads to higher NGDP volatility – and this also goes for relatively low rates of NGDP growth. Hence, it is not only in hyperinflation scenarios that this is the case. As the graph shows if we go from an NGDP growth rate of 0-6% to 14-20% the volatility of NGDP growth doubles! 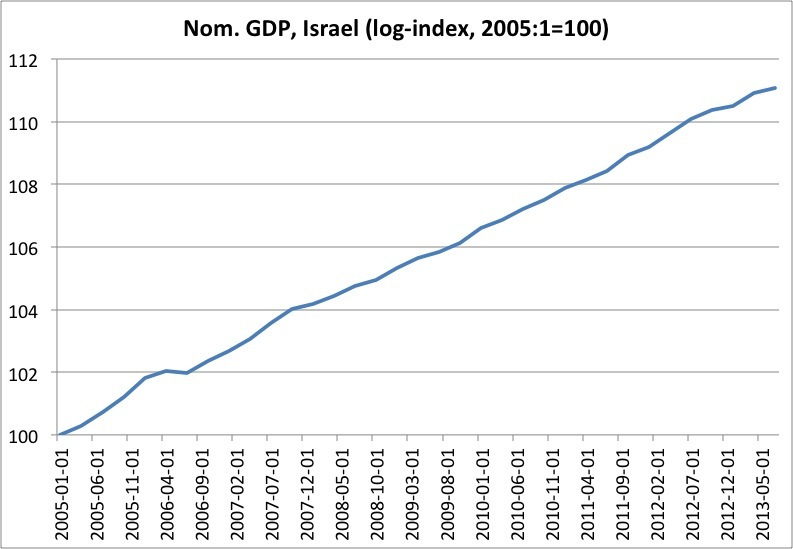 However, the graph also shows that the relationship is not linear. In fact if NGDP growth drops below zero – as have been the case in many countries since 2008 – then the volatility increases. The graph also shows that there historically has not been any significant difference in NGDP volatility countries with NGDP growth of 0-2% or 4-5%. The graph should make Scott Sumner happy as Scott has been arguing that the Federal Reserve should target 5% growth (level targeting). Historically NGDP growth of 5% has minimized the variance of NGDP growth and there would probably be little to gain – in terms of reducing NGDP volatility – by targeting a lower rate of NGDP growth. However, there would clearly be a cost of for example targeting a higher growth rate of for example 10%. I think there is important lessons to draw from the graphs below. First and foremost that an NGDP growth target between 0% and 6% is preferable to higher or lower growth rates. But it should also be remembered that this is a very simple analysis and we could certainly lear a lot more from studying the country specific data closer, but all in all I don’t think Scott is making a major mistake when he is arguing in favour of a 5% NGDP (level) target in the US. PS Forgive me for using volatility and standard deviation synonymously, but I am sure you get the drift. And please don’t kill me for saying that minimizing the volatility of NGDP is “optimal” – that is just a figure of speech. PPS I really didn’t do the calculations on my own – I got quite a bit of help from my young and clever colleague Mikael Olai Milhøj. UPDATE: Another young and clever colleague of mine Jens Pedersen noted that the logic of our results actually mean that a country like China with a trend growth rate of real GDP well above 6% should de facto be a deflation target’er to minimize NGDP volatility. This is what the data is saying – at least indirectly – but I am not sure that I am ready to argue that. I am however pretty sure that George Selgin would tell me that that is in fact what China should do. When we study macroeconomic theory we are that we are taught about “money neutrality”. Normally money neutrality is seen as a certain feature of a given model. In traditional monetarist models monetary policy is said to be neutral in the long run, but not in the short run, while in Real Business Cycle (RBC) models money is (normally) said to be neutral in both the long and the short run. In that sense “money neutrality” can be said to be a positive (rather than as normative) concept, which mostly is dependent on the assumptions in the models about degree of price and wage rigidity. As a positive concept money is said to be neutral when changes in the money supply only impacts nominal variables such as prices, nominal GDP, wages and the exchange rates, but has no real variables such are real GDP and employment. However, I would suggest a different interpretation of money neutrality and that is as a normative concept. Normally the discussion of money neutrality completely disregard the model assumptions about the monetary policy rule. However, in my view the assumption about the monetary policy rule is crucial to whether money is neutral or not. Hence according to Hayek monetary policy should ensure monetary neutrality, which is “a stage of equilibrium which are described by general economic theory”. In Prices and Production Hayek describes this in terms of a Walrasian general equilibrium. Therefore, the monetary policy should not distort relative prices and hence monetary policy should be conducted in a way to ensure that relative prices are as close as possible to what they would have been in a world with no money and no frictions – the Walrasian economy. As I have discussed in a numerous posts before such a policy is NGDP level targeting. See for example here, here and here. If we instead think of monetary policy as a normative concept then it so much more obvious why monetary policy suddenly has become so central in all macroeconomic discussions the last four years and why it did not seem to play any role during the Great Moderation. Hence, during the Great Moderation US monetary policy was conducted as if the Federal Reserve had an NGDP level targeting. That – broadly speaking – ensured money neutrality and as a consequence the US economy resembled the Walrasian ideal. In this world real GDP would more or less move up and down with productivity shocks and other supply shocks and the prices level would move inversely to these shocks. This pretty much is the Real Business Cycle model. This model is a very useful model when the central bank gets it right, but the when the central bank fails the RBC is pretty useless. Since 2008 monetary policy has no longer followed ensured nominal stability and as a result we have moved away from the Walrasian ideal and today the US economy therefore better can be described as something that resembles a traditional monetarist model, where money is no longer neutral. What have changed is not the structures of the US economy or the degree of rigidities in the US product and labour markets, but rather the fed’s conduct of monetary policy. This also illustrates why the causality seemed to be running from prices and NGDP to money during the Great Moderation, but now the causality seem to have become (traditional) monetarist again and money supply data once again seems to be an useful indicator of future changes in NGDP and prices.